Here's something to know about writing: Ideas are easy. You can get them anywhere. 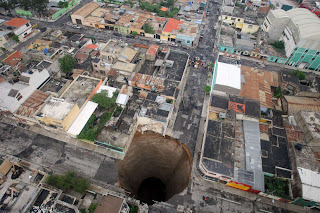 Look at this picture: It's an aerial shot of the sinkhole that's trying to eat Guatemala. Tell me you're not thinking about some crazy science fiction story, or a terrorism thriller, or an apocalyptic epic of some sort. You'd be in good company. Sources: Bat used to kill Peru woman - The actual story involves a baseball bat, but the headline makes me think of a murder mystery involving a rabid bat slipped in through a window. Cops follow 9-mile trail of blood, tissue - Oh God, the horror stories you could get out of this one. What sort of monster can create a 9-mile trail of blood? Is it squamous or rugose? Belief blog: Has market become God? - What sort of market would we have if we thought that all the ups and downs were caused by a higher power, independent of companies' actual performance? Or, what if churches traded on stock exchanges? Or, what if there was a church dedicated to the market's power? Man found four days after car crash - Alive, as it turns out from the article. So what was he doing for those four days? Who'd he meet? Was he running from somebody? Wallet returned after 70 years - I think Letters to Juliet covered this sort of thing, and Sarah assures me that was a good movie. With a wallet, of course, it doesn't have to be a romance. Maybe a cursed wallet gets passed from owner to owner? Or maybe it's something that was found in a dead man's effects.